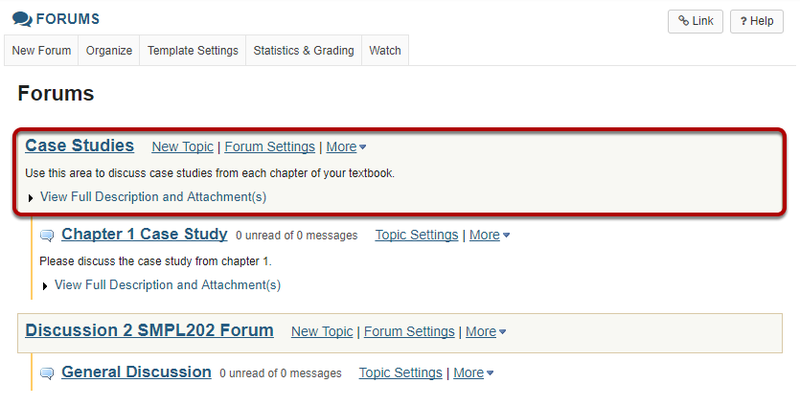 Sakai Community DocumentationSakai 19 User Guide (English) ForumsHow do I post to a forum topic? Forums are organizational units that group topics within the site. You cannot post directly to a forum, you must first enter a topic and post your message there. In order to post to a forum topic, you will Start a New Conversation or thread. Select the Forums tool from Tool Menu in your site. This is an example of a forum. The forum title will appear in bold and in a larger font than the topic titles indented beneath it. If you would like to view more information about the forum, you may click View Full Description to view any additional information provided by the site owner. Select a topic within the forum. This is an example of a forum topic. Click on the title of the topic to enter that topic. Click Start a New Conversation. Starting a new conversation is the same thing as starting a new thread. After you click Start a New Conversation, the message composition window will appear. This description box allows the use of Rich Text Editor. Note: The message box will keep track of word count in the lower right corner. If desired, there is an option to upload attachments to the conversation. Click Add attachments to browse for and select your file. After completing the conversation, click Post to make the conversation viewable. Prev: How do I organize forums and topics? Next: How do I reply to a forum post (i.e. conversation)?